The Troops to Teachers graduate and non-graduate programmes were launched today. The government today launched Troops to Teachers - a new scheme designed to make it easier for highly-skilled former members of the Royal Navy, Army and Royal Air Force to become teachers. Education Minister David Laws said the scheme would help ex-servicemen and women, who had the potential to become great teachers, make the transition to the classroom. He added that pupils would benefit from the experience, background and skills that ex-military personnel had gained in “our inspiring armed forces”. Many members of our inspiring armed forces possess the skills and expertise relevant and transferable to the classroom – leadership, discipline, motivation and teamwork. Every child can benefit from having these values instilled in them. We want to capture the ethos and talents of those leaving the armed forces, and bring this experience into teaching. We know that our highly-skilled servicemen and women can inspire young people and help raise educational attainment. Troops to Teachers will make it easier for those who have already contributed so much to our country to continue their brilliant work - this time in the classroom. This new initiative will be beneficial not only to the veterans who are able to undertake a new and challenging career, but also to the young people who will learn from teachers that possess unique expertise in areas such as leadership, problem-solving, and adaptability. A career in the armed forces provides skills and experience you cannot gain anywhere else, and I would encourage anyone leaving the services to take the opportunity to pass on their invaluable knowledge and instil respect, discipline and pride in the next generation. The 1-year School Direct salaried course: to apply, forces leavers need to have served for 3 or more years. They will be given additional, bespoke training to ensure their teaching makes the most of their unique skills and experience. 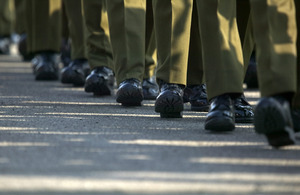 The 1-year School Direct non-salaried route: forces leavers who were in the military for any length of time can apply for this, and for a £2,000 bursary uplift. A 1-year university-based course, for example a PGCE: forces leavers who apply for this route may also be eligible for the £2,000 bursary uplift. From January 2014, highly-skilled ex-military who do not have degrees, but who have gained qualifications or experiences in the forces - for example, teaching, instructing, mentoring and coaching - will be able to enrol on a new 2-year, school-based, salaried teacher training programme. This will be a far quicker and more attractive route into teaching than currently exists for non-graduates because there will be no need to study for a degree before starting teacher training. This programme will use a rigorous assessment, selection and recruitment process to identify armed service leavers with the potential to become outstanding teachers. Service leavers who successfully complete the 2-year programme will gain a degree as well as QTS. Lance Bolton, 30, served as a guardsman in the Coldstream Guards between 2003 and 2007, including a 7-month tour of Iraq. He starts as a design and technology teacher at Oriel High School, Crawley, West Sussex, this year. When I left the Army I knew I wanted to be a teacher. I didn’t have the GCSEs or A levels to get to university to do a teaching degree so I had to do a year’s course first. But I got my grades and I’m just about to complete 3 years at university, the last 2 at Brighton. I’ve done 2 placements at schools and loved it. I can’t wait to start at my new school. I think I’ll be able to transfer the skills and experience I learnt in the Army to the classroom and help pupils understand the importance of teamwork, discipline, punctuality, respect, looking people in the eye. Troops to Teachers is the latest part of the government’s drive to promote military ethos in schools. The Department for Education (DfE) has worked closely with the Ministry of Defence (MoD), their re-settlement contractor (Career Transition Partnership) and some of the most outstanding schools and initial teacher training (ITT) providers, led by the University of Brighton, to develop the Troops to Teachers programmes. Service personnel can apply for any of the routes so long as they are not longer than 2 years out of the military, or are within the last 2 years of their military career. The Troops to Teachers training providers are Bath Spa University, Canterbury Christ Church University, the University of Reading, the University of Huddersfield, Staffordshire University, and the University of Southampton. Each will work with outstanding primary and secondary schools to support development and delivery of the programme. For more information on the government’s broader drive to encourage ex-military to use their skills and talents in the classroom see the Military ethos section of the Department for Education website. Service leavers who do not have a degree, but have previously gained qualifications or additional vocational qualifications (such as Defence Train the Trainer or Defence Instructional Training) and experiences (such as teaching, instructing, mentoring, coaching, etc.) in the armed forces that equate to a minimum of 120 subject related Credit Accumulation and Transfer Scheme (CATs) credits, may be eligible to enrol on the new non-graduate Troops to Teachers programme.